If you haven't been to a Dudebox party in Toronto yet, you have no idea what kind of magic you're missing out on. What started as a series of house parties in a Spadina Avenue loft in 2007 has now morphed into a beast of social activism and marque nightlife events. 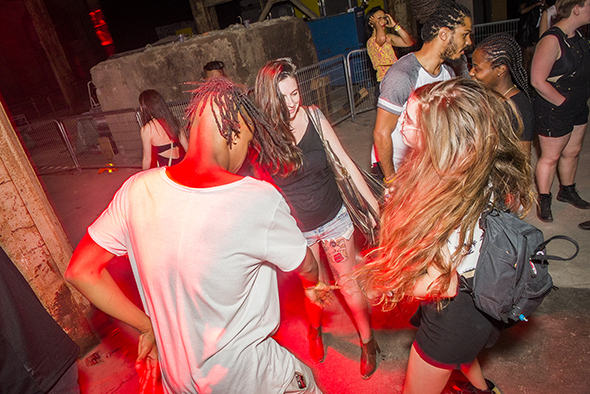 These are massive, grimy dance parties thrown in unconventional spaces across Toronto. Party people can get down on it and do something really good for the world - without even trying or even necessarily knowing it. "I'll hear from people sometimes and they'll write me saying 'Amazing party last night, hey, did you give all the money to that drought in Somalia?'" recounts Said Yassin, one of the organizers. "And I'm like yeah, that's what we do." Sitting at a table with Yassin as well as co-founders Daniel Tal, Ahmed Tahib and Matt Powell, a person quickly understands why Dudebox is so great. It's because they are great, and in turn the people that go to their events are great. "Good vibes always attract good vibes," Tal says. "We first started throwing parties for profit, and then we kind of noticed it was dividing us to a certain point, the whole money aspect. So we thought, let's just give this money to charity." One of the first parties they threw as a fundraiser specifically was to raise money to buy a cow for a village in Kenya. Tahib had recently returned from a volunteer trip there and pitched the cause. The groups obviously agreed and the party was so successful they raised enough money for two cows. "Whenever we pitch our origin story I also pitch with that because there was something physical happening," Powell says. "Let's do something in this community." The group felt very strongly that the purpose of every party going forward would be to raise money for a worthy cause, and the rest is history. They've since donated $140,000 to both local and international nonprofits, the last one being their Yes Yes Y'all collaboration party (they've now done three together) at The Hearn. Together with 2,500 people they raised $8,000 for charity. $4000 went to Regent Park School of Music and $4000 is going to the GoFundMe page for the families of the victims in Orlando. 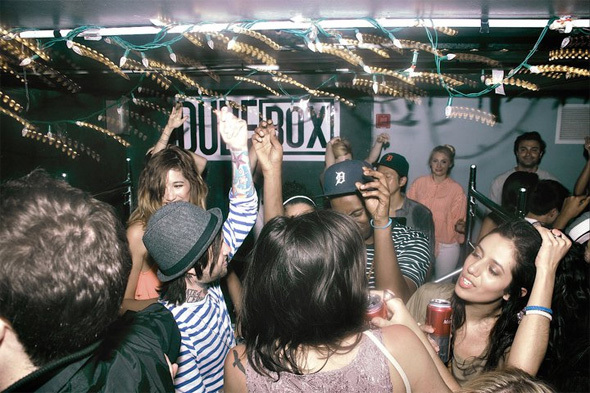 With a lack of governmemt organizations that give directly to a local charity, this is where Dudebox becomes not only an important thread in the fabric of Toronto's nightlife, but a model for how to do do real good in the world, almost instantly. "This is why Dudebox is very important and very special," Taib says. "Because we're providing what the government can't. Because of project-based funding, there hasn't been a lot of financial support going around to charities... we've kind of taken up that spot." "It's just part of the vibe," Tal continues. "You don't even know what you've just done, but you've just donated to charity. That's the heart of Dudebox... a notion that we can turn any element in our society that involves revenue generation, any business at all, into a social enterprise. You can be partying and raising money for charity." "The grassroots person-to-person approach is what we're all about," Powell says. "We don't get paid for this, so you have to take in special moments and let that be your fuel to make this happen." Sure the history and philosophy behind the parties is essential and interesting (Dudebox was the name given to their sweaty, run-down, floors caving in, loft space, and though they're not huge fans of it, it's stuck ever since), but that doesn't matter if you're not able to show people a good time and build a reputation for fun. Based in hip hop, now with reggae, dancehall and afro-beat influnces thrown in, the crew tell their DJs to "play music that girls like." 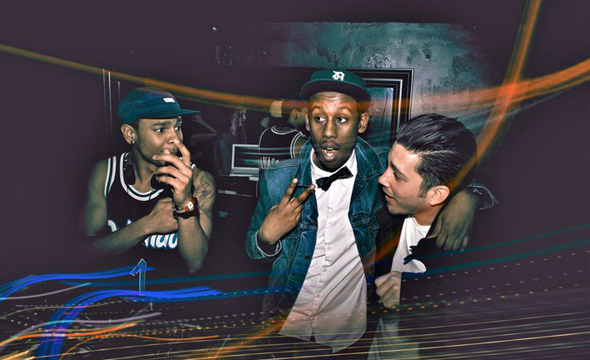 "We try to emulate Sean Paul's 'Get Busy' video as often as we can,' Tahib says. "But it's doesn't have to always be hip hop," Tal says. "We've had DJs playing S Club 7. If the girls are turning up in the room, then the room is turning up." "More hands in the air and less gunshots," Yassin says with his pistol fingers popping in the air. Towards the end of our conversation, the guys get a call about a potential venue for their next party that would bring things to a whole other level. You can see the fire behind their eyes when the location comes up an everyone starts buzzing. For now, Dudebox will keep pushing Toronto's nightlife buttons, gently forcing us into venues we haven't even dreamed of for parties. And you better believe they're going to keep plotting, not only to get bigger and more popular, but to raise shocking amounts of money for charity. We all have different answers [about the future of the party]," Tal says. But all these different answers and opinions is what keeps Dudebox very special. Moving forward as a group is always priority number one. It's not about having big parties ... it's about keeping our friendship alive and thriving." Follow Dudeboxon Facebook and Twitter. 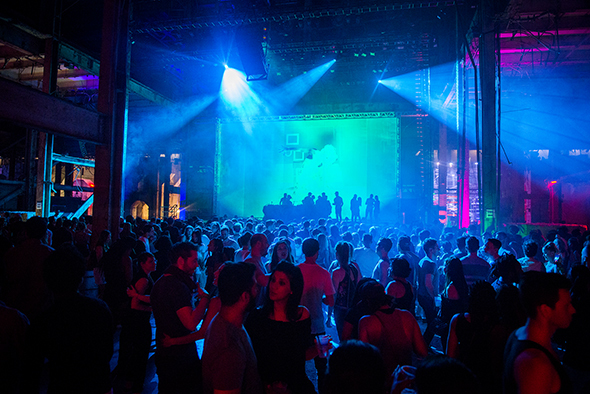 Photos by Hector Vasquez and courtesy of Dudebox.